If you spend more than ten minutes with my boyfriend and I, you will quickly learn that we are huge Trader Joe fans and we try to convert everybody who doesn’t already know about it. For the most part, it is the only grocery store we go to! We love the witty creative packaging, organic selection, but most of all the moderate pricing. Woah, What!? You mean not everyone drinks the TJ kool-aid? 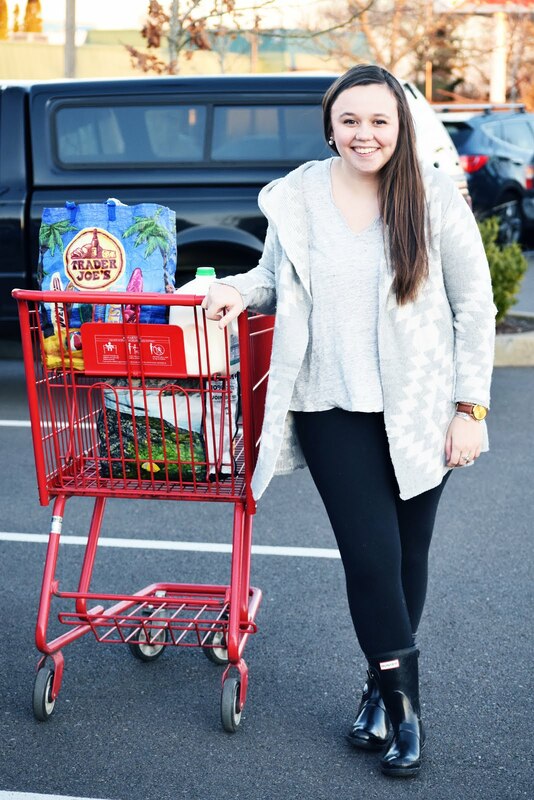 Grab a seat and a cup of coffee because I am about to lay out exactly why I shop at Trader Joes and how to make it work for you. 1. All products are the stores own brand, and its great! There isn’t a choice between coke or pepsi, because the only cola available is Trader Joes brand. While initially it might sound like taking competition out of the situation makes things more expensive, all the pricing is generic which saves you $ in the end. The packaging of all the products is also adorable, which is a random bonus in my book. Clipping coupons is a waste of time at Trader Joes since all products are generic which frustrates some folks. If you need to find a deal they do release the “fearless flyer” seasonally but for the most part, the prices are super reasonable to begin with so this is rarely a problem. I love Costco as well for this very reason, samples are thebomb.com! They always have one or two things to try in the back along with a sampling of coffee. It is my favorite part once I reach the back of the store to try something new and get a quick jolt of caffeine while I finish shopping. The benefit of this is that I have never lost someone in the aisles. Everything is densely packed, organized well, and it doesn’t take much to browse the whole store. Some people prefer to do the chopping themselves and save the money, but I do like that when I am in a rush is grab the packaged “pre-chopped” veggies to throw in the crockpot. In the fall they have a butternut squash bag that is all chopped and ready to be made into soup, it is the best. Going down the freezer aisle is tricky because of how delicious everything is, which is not usually the case with frozen food. Cheesecake, cream puffs, pizza, pot stickers, smoothie in a bag, croissants, seasonal items, orange chicken, falafel, meatballs, and its all delicious without tasting like it came out of a freezer. 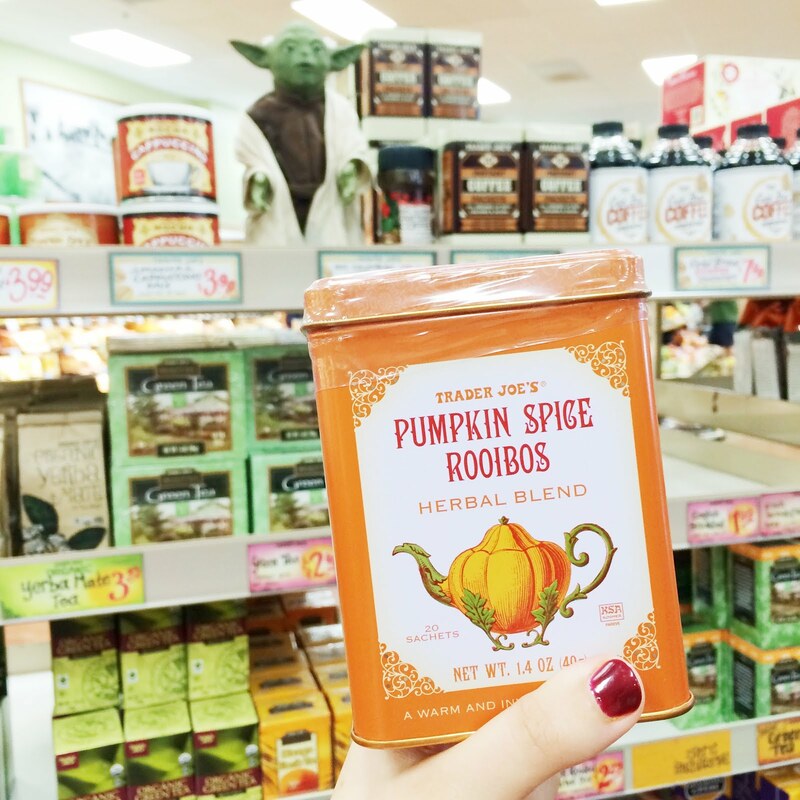 – Personally I love the Pumpkin selection available at Trader Joes, everything arrives in mid September and sticks around till just after the holiday season. The holiday selection is awesome too, but make sure to stock up because these items are seasonal. – If you have kids and find the hidden resident stuffed animal in the store, your kiddos can get a fun sticker upon checkout. – One of the best deals is the greeting cards! They are always .99 cents and are oh so cute. Other great deals are the coffee, tea, and wine! Looking for some recipes to fit your newfound Trader Joes knowledge? Here is an easy crockpot idea and a cookie recipe using their products! PS. this post was not sponsored in any way by Trader Joes I just really really like the store 🙂 In general I try to share products I truly love and all opinions are indeed my own!